For many people their pets are their children, and like children they can also get into trouble. Especially when it comes to the pools. Many parents know that the pool ,in the backyard can be a place fun and joy, but also a place of danger. However often time pet owners overlook the pool as a danger when it comes to their pets. Many a dog owner has called for a removable barrier once they had already lost one dog to drowning. Older dogs and small dogs are the most common type that can have terrible run in with the swimming pool. They are not able to find the steps when they fall in and grow to tried to pull themselves out. Because of this a pool fence or pool netting is great for older dogs and small dogs. Pool Guard installs at least two to three safety fences a month just for dogs. While is may be a small part of our business it is huge for pet owners that are worried about their dogs when they are away. 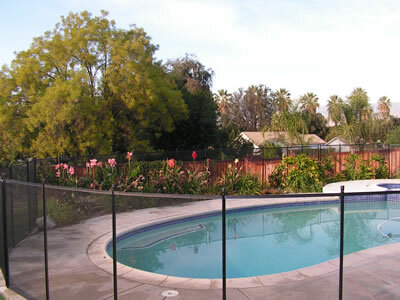 Once you have a pool barrier from Southern California Pool Guard you will be able to go on vacation and spend the whole as well as spend the whole day at work not worrying about the safety of your pet. Call us for a free quote today, and most likely we can have a fence installed for you in about a week. We serve all of Southern California, focusing on Riverside, Orange and San Bernardino counties. From Tustin to long beach , from Indio to Palm Springs, and From Claremont to Temecula we can give you the ability to take care of your children and grandchildren and pets safety with a great looking swimming pool barriers and fence as well as Pool safety netting. Keep in mind that pets can rip mesh through chewing, so not all dogs are able to be protected from mesh removable pool fencing. Click here for more pool safety information.